THE HEROESONLINE BLOG | HEROESCON 2015 GUEST LIST UPDATE :: STAN LEE!!! HEROESCON 2015 GUEST LIST UPDATE :: STAN LEE!!! Stan Lee is coming back to Heroes Convention! 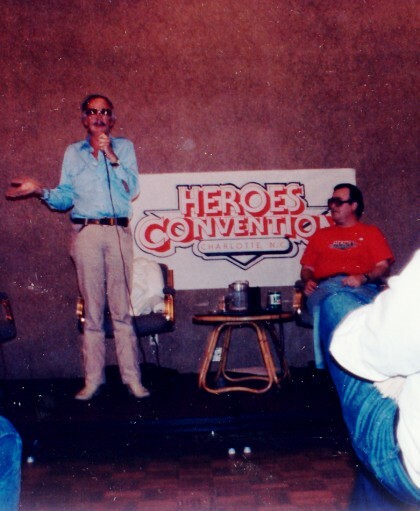 The photo above is from Stan’s first HeroesCon appearance in 1984! We’re delighted that Stan has worked us into his busy schedule even if it’s just for one day. Stan will be appearing and signing on our show floor on Saturday, June 20. For the serious Stan ‘The Man” Fan you can join Stan Lee and a very limited number of other TRUE BELIEVERS for a meet and greet on Friday evening. Don’t worry we’ve got plenty of packages for other budgets. For full descriptions, click through to our ticket page. Don’t forget, you need a HeroesCon 2015 3 Day pass to enjoy any of the Stan Lee packages. I would like to have my son meet Stan Lee since meeting him is on his bucket list. I have a couple of questions. He is 12, and since kids 12 and under get in free, will he still be able to participate in the Saturday Early Entry w/ Autograph/Photograph session? Also, does the photograph session (the $82 one) include a picture with Stan Lee, or is it an autographed photo of him? What is the schedule for autographs/photographs? We don’t want to have to stand in line for hours with our young child. The only schedule I could find on the website was from last year. Will Stan Lee also be appearing at any Q&A panels or scheduled events? No, just signing autographs, taking photographs and appearing at Friday’s Meet & Greet. Can I purchase tickets for Stan Lee at the convention or do I have to pay online?